Lorinc, J. and Pitter, J. (Eds.). (2016). Subdivided: City-Building in an Age of Hyper-Diversity. Toronto: Coach House Books. ISBN: 9781552453322. 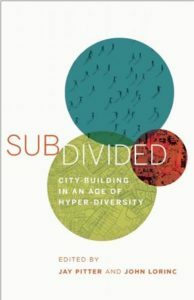 Subdivided: City-Building in an Age of Hyper-Diversity (2016) is a collection of essays taken from a varied source of contributors writing about their experiences of diversity living in Toronto edited by Jay Pitter and John Lorinc. The book attempts to unpack the municipal and national mantra of “diversity is our strength” by exposing the reader to a myriad of unique experiences and world views and complicate the narrative of Toronto as the most multicultural city in the world. As Pitter writes, the reality of hyper-diversity demands a recognition of “diversities within diversities within diversities” and of the intersectionalities of the identities associated which make up that diversity. Neither of the editors belong to the discipline or the profession of urban planner or have been involved in municipal governance, they are better described as city-builders: writers and activists that have invested personally and professionally in advancing progressive action in Toronto. Pitter has worked (and grew up in housing) with the Toronto Community Housing Corporation and both have written for publications such as Spacing and Walrus, among others. The rest of the contributors make up a diverse group of writers, urban planners, journalists, and lawyers among others. With a narrative form and personal stories, Subdivided is aimed at a broad audience. While the inclusion of more theoretical and ideological language might distance some readers, the personal tone of the contributions anchors their stories in a very real and relatable way. Although the stories shared in the book are very different, what they and the editors share is a desire to critique the current conception of diversity in Toronto and to explore the socioeconomic realities of the divisions separating those diverse groups. An interesting thread that the book picks is the universality of the impact upon these disparate groups relating to the changing economic realities of Toronto as housing prices skyrocket and government programs have been curtailed or abandoned completely. While reaching few conclusions, this exploration of the meaning of diversity in a changing economic and social context does accomplish its intended purpose – to start conversations. Exposing the reader to experiences of the “diverse” living at the margins of the popular and institutionally supported conception of Toronto’s diversity as a fait accompli (an attitude the transnationally wealthy in Toronto like to pat themselves on the back for), this anthology raises the question of what that attitude really means for those living that diversity without the power to challenge the accepted rhetoric.